Take lessons further with the Full HD 1080p resolution Epson ELP-DC21 document camera. 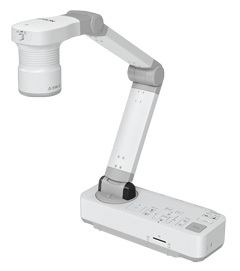 This flexible document camera easily captures and displays books, 3D objects and experiments. Simplified connectivity makes installation and control easier than ever before. The ELP-DC21 has a robust and durable design, with great security features allowing it to be permanently placed in a classroom or boardroom. Teachers can use the ELP-DC21 to demonstrate the view from a microscope, a live experiment in science class or display fine prints from an architectural drawing onto the bigger projected screen. Compatible with Epson EIT (Easy Interactive Tools) software, users can take advantage of features such as split screen mode, video recording with audio, image capturing and save recordings to an SD card or computer.